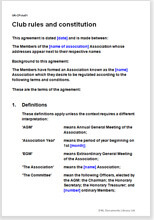 Comprehensive terms and conditions, or rules for any type of unincorporated association, members' group, club or lobby group where there is no property and no alcohol licence. Kindly note, however, that both documents (IN-CPcl01/ IN-CPart04) are mandatory requirement for filing in respect of registration of a Society. You have to therefore, consider purchasing both the above documents together as any one of them is incomplete without the other. Any group of persons seeking to form a Society for religious, educational or charitable purposes.